Trevor Brazile ropes his steer Tuesday morning during the first day of competition at the Dodge City Roundup Rodeo. Brazile is the No. 2 cowboy in the steer roping world standings so far this season; he also is the top-ranked all-around cowboy, the No. 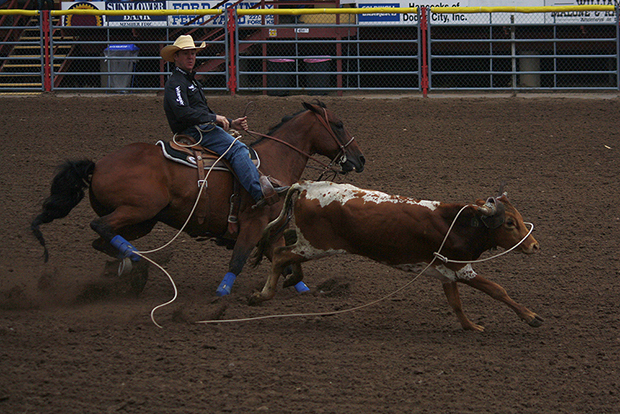 8 header and the sixth-ranked tie-down roper. He is also scheduled to compete again Saturday night. The final round of Dodge City Roundup Rodeo steer roping is scheduled to begin at 7:30 tonight at Roundup Arena. Through two go-rounds, 17-time world champion Trevor Brazile leads the average race, posting a 21.2-second cumulative time. He also won the first round with an 8.9-second run, the fastest of the event so far. The first Roundup champion of 2013 will be crowned tonight. Steer roping: First round: 1. Trevor Brazile, 8.9 seconds, $1,929; 2. Jess Tierney, 10.4, $1,596; 3. Joe Wells, 11.2, $1,264; 4. Tony Reina, 11.3, $931; 5. Brodie Poppino, 11.4, $599; 6. Brent Lewis, 11.7, $333. Second round: 1. Chet Herren, 10.7 seconds, $1,929; 2. Jarrett Blessing, 10.8, $1,596; 3. (tie) Howdy McGinn and Roger Branch, 11.6, $1,097 each; 5. (tie) Jason Evans and Chance Kelton, 11.7, $466 each. Average leaders: 1. Trevor Brazile, 21.2 seconds on two head; 2. Jess Tierney, 22.8; 3. Roger Branch, 24.0; 4. Jason Evans, 24.1; 5. J.D. Yates, 25.6; 6. JoJo LeMond, 27.2.